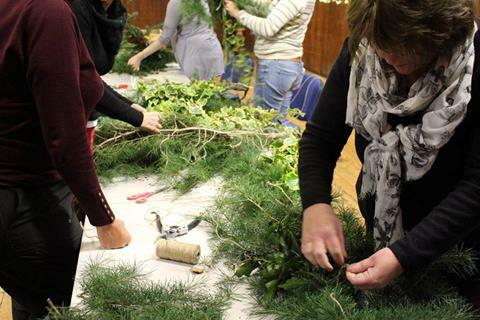 Last year the wreath workshops all sold out & the garland workshops were very popular. If you can’t make the dates below I have some small personal workshops going on here at Apple Tree Cottage or we can come to yours if you have a small group of friends that want to join in. 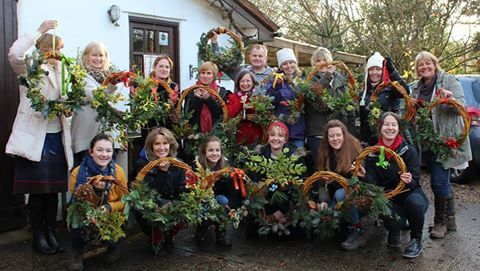 December 3rd & 4th Willow Wreaths at Apple Tree Cottage, Potten End, Berkhamsted 10-1pm coffee/mulled wine included. As always, there’s plenty of help on hand & we can especially help folk with the willow bending as it can be a bit fiddly but there will be a man on hand with large hands!! Lots of brightly coloured ribbon to choose from but you’re welcome to bring your own. 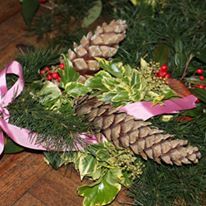 All materials, flowers, berries, seed heads, cones, greenery are sourced locally from grounds & gardens I work in-no nasty chemicals or imported plastic garbage. The willow is grown & cut locally by The Sunnyside Rural Trust in Berkhamsted. The door garlands or gate swags can be adorned with lights once you hang them at home.